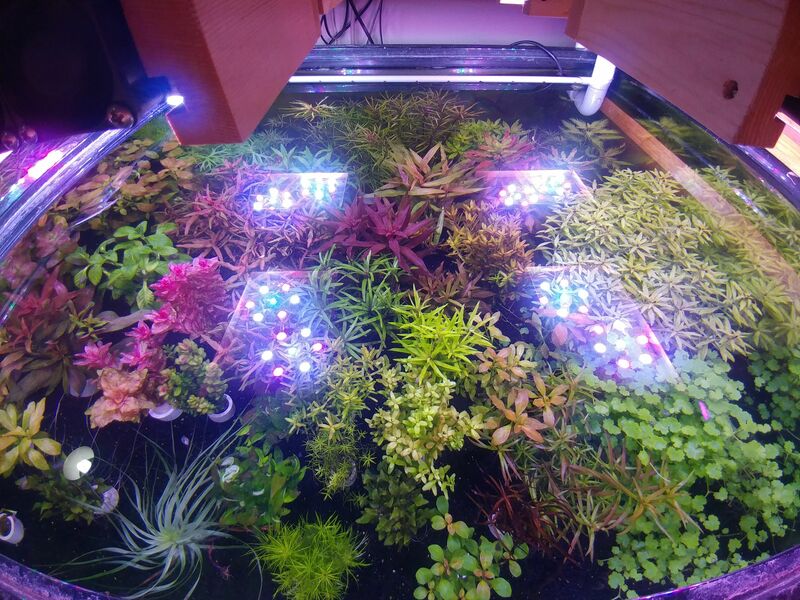 The Planted Tank Forum > General Planted Tank Forums > Tank Journals > Journal of My 80 Gallon Tank "Rolling Along Nicely"
whaat? that FTS is pretty awesome. plugs and all. I love it. This really impresses upon the viewer the sheer immense of the collection. It is a collection, for sure. 2 new species arrived yesterday, at least they were submerged growth. May I ask, what is this guy?? Reminds me a lot of arcuata in size, a bit bigger. Way more red and very tough stems feels like a twig. Greggz and ipkiss like this. looks like Burr's Isoetes lacustris but in red. Some "fruit stand" material but the colors don't look right. The glandulosa is about 5" diameter now, the diamond variety may be bogus, it looks the same. Not going to play/edit these phone pics, they are what they are but some turn out really great. L.Cardinalis is still growing almost a foot tall even with the BDBS. Many small plantlets that I keep but the main stalk is a monster. A friend is taking the large stalks to grow emersed in his green house next week. It is Friday eve, I could stay up late and trim but WTH I'm going to test KH in the 33G and dose some HCl and see where it goes from there. I'll post in the other thread with results if all goes well! Greggz, ipkiss, burr740 and 1 others like this. @Immortal1 I can see a difference in the "atlantis" now. Will post some pics soon but not this eve. Been warm for me, even the A/C on today for a bit. Not too warm but rather humid in the house. We've had evening and overnight rains. Now the relaxing part of the day, Trimming and not hooves! I dread it, not normally but this eve I'm not up to it but it must happen. The 33G I dosed the HCl in has had a growth explosion over the past week. The two are not related it's due to my slight neglect. The 33G has no phish and only top offs except for a quarterly WC. Need to WC more often due to a creep up in KH levels. Not sure how this is happening but it is? 75G is a jungle with algae covered glass. Sort of a plant repository for species I don't want to part with. Diatom algae with STS substrate for years now, go figure. I don't want to change this tank, it has very aged Amano shrimp that clean any plant I place in it to pristine condition and no BBA what so ever! On to the trimming part! Ah the fun of trimming. Look forward to your pics of the atlantis - good to hear it is doing well for you. Taking a break from some trimming and checking the web! Sitting back and thinking about my 80G tank. The tank is 2 years old now, time flies. Capped soil run basically lasted 18 months before replacing with straight BDBS. Did I really need the capped soil? Most likely no, it did provide a kick start in some ways. My normal dosing followed very early on and it is about the same today with an inert substrate. The plants had to alter there uptake I suppose, did that bring on Algae-geddon? Still need to lower the Kh in this tank, the HCl dosing will help. But I'm in no hurry, so in time it will happen. Some breathing room too, only 4 experiments going on right now! 2 to convert to submerged and 2 new to me submerged plants! The local weather is warming quickly for me. I have 7 new ponds to check out for plants already on my list. It will be a busy Spring! Still trimming a few species each night. 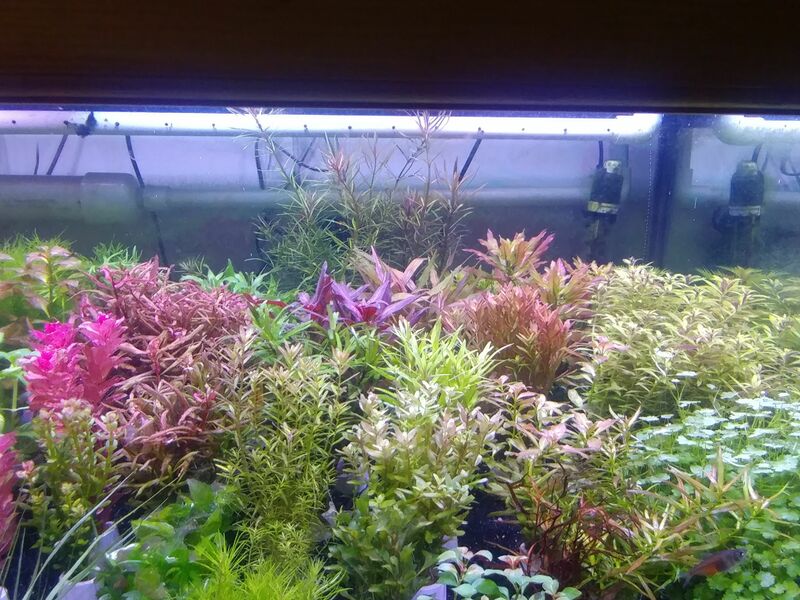 Making a big for sale list as I go, there is way too much plant mass. About every third week I need to clean the glass a bit, not so bad. Is still a problem but not as severe. Maybe down to 1/3 @ the algae high point. For me this has always been related to some form of dying/rotting plant matter. Typical species in this arena are shaded ranunculus that rots @ the roots and runners. Pulled all stray plants and no damage? Pulled pogo erectus 2 days ago and found a prime offender. Root runners from about 3" above substrate were securing the plant but the bottom of the stems were rotting away? This clean up got me 2/3 of surface scum gone. Tonight I will pull all ammannia and only save primo stems. Don't think it's the ammannia but it needs some work. Another prime offender is eleocharis elongata a taller grass type. 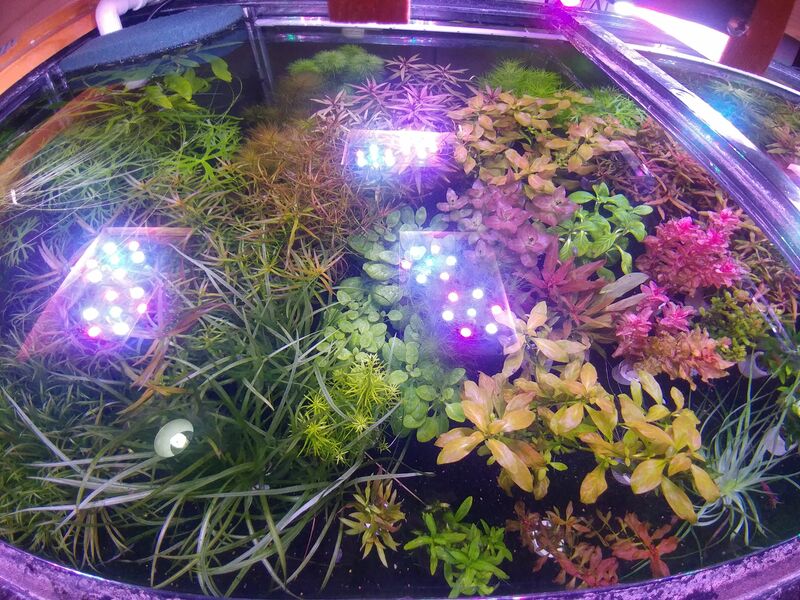 If bottoms start to go it fouls water with surface scum, but it looks healthy? A lot of peruensis lower leaves dropped during the submerged conversion but I pic them out daily. About 18 months ago I tried daily water changes, didn't help until the troubled plant was removed. Once it's all removed the scum is instantly gone. Trimmed the L.polycarpa the other eve, yielded about 14 extra plants. This one really branched out with the environment change from capped soil. Same token all pogo's did the same thing. L.aromatica branched out in the same fashion, now I have over 12 stems of it. Normally I only keep 6, they are primo stems with solid purple tops though. B.japonica is another off the hook plant, more so without capped soil. Planted 2" apart they are now a very dense "chunk" of the right side of tank. All is well, feed every 3rd day. Amano shrimp in the 75G still tag-team on snail extraction and Panda Cory's do the same in the 80G frag tank, empty shells everywhere. Harlequin rasbora's seem to have paired off, a mating ritual maybe? No longer the group of 8 traveling together. I can only say they are comfortable in the environment I've provided. C123 Cory's are true slugs of the aquarium. Don't move for hours at a time, if I don't feed they are conserving all energy. 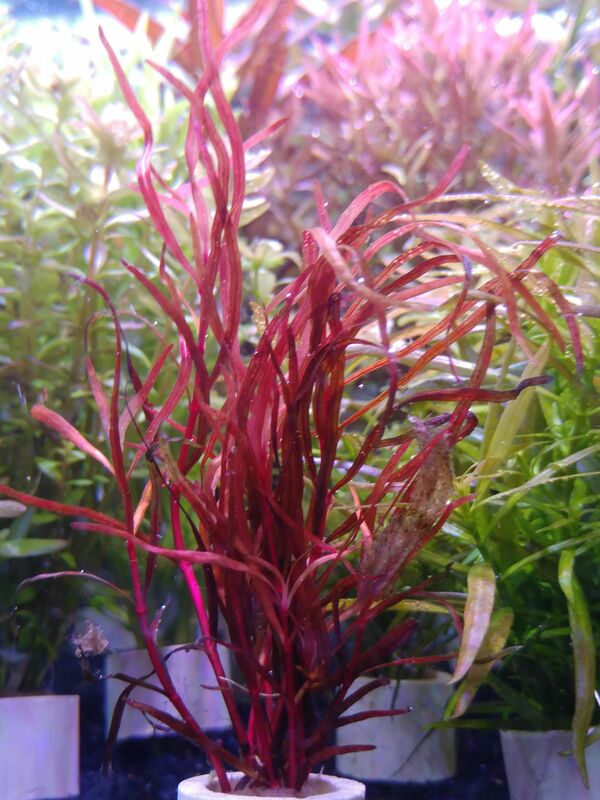 I'm still growing arcuata and it is very narrow leafed and quite red @ 75PAR. What I am growing is much narrower than brevipes even. All of the luwigia repens species are a tough road for an ID. This plant came to me green, emersed, and somewhat narrow at first. Now it is very narrow and very red in color. Very prolific with roots @ lower nodes too. I will need to post a pic of what I have going on! Yes sorry, late to reply to this. 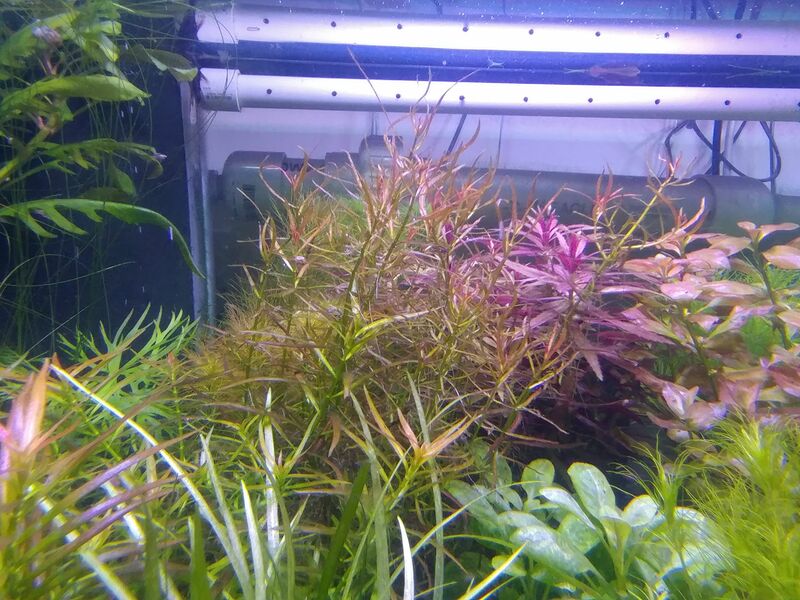 Doesn't look at all like Arcuata, looks more like.. well more like the "atlantis"
Maybe I can buy some off you as I'd love to see if it ends up looking identical to my old Repens X Arcuata! It was a highly variable plant that I had in various stages of color and leaf thickness, but like Burr said it would grow prostrate and it would widen aggressively. I'll get a pic of this arcuata hopefully this eve. Happy Easter and Good Evening All! Trimmed a whole lot yesterday eve, doesn't show it but I did. Little algae here and there but no BBA except for PVC high flow areas. Came home with more plants from LFS yesterday! Not like I needed any but? Luwigia orange that will most likely look like atlantis. 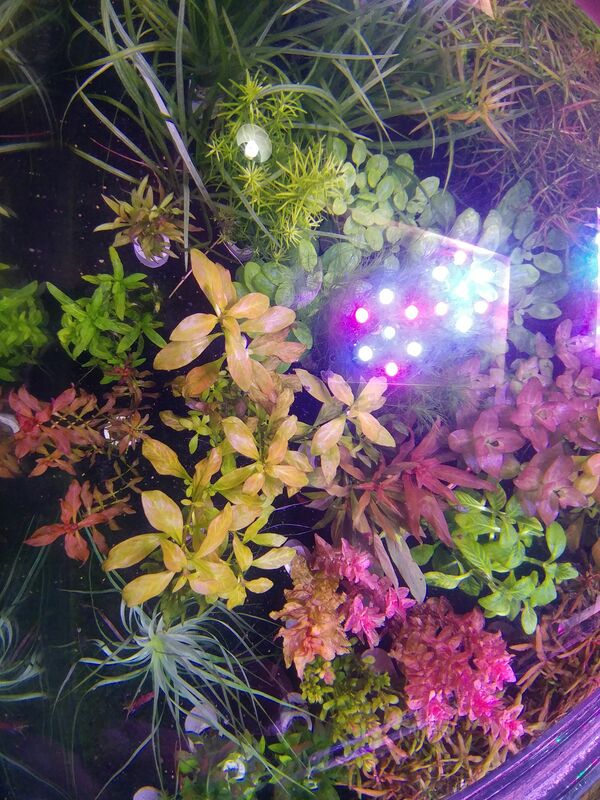 Testing the look of the ludwigia's @ the moment. Macrandra that looked good @ LFS, rare for this to look good from there. Way pink right now hope it shows more red soon. And a bulb of barclaya with 1-1" leaf that cost me $7.99, felt very robbed. Somehow they managed to have the last 20 or so bulbs of this available from anywhere, hard to come by these days. Speaking of bulbs, wish I never parted with all of the red tiger lotus. Should have kept some for future use in the 75G. I just had to stop in, their FB page said plants arrived from 3 separate vendors on Friday so Saturday morn was my only chance to get anything. They sell out very quick and are sent home with just Flourish Comp, poor plants! Talked to the owner about Deep Blue tanks that are supposed out of business. I really want that 8 sq.ft. footprint for plants that frag tanks provide. Could be out of luck, not sure yet. 100 gallon long 6' tanks are a thing of the past and buying them used means they are very old. @Chlorophile here is a pic of the arcuata. It is a messy plant, many branches near the surface and many roots from nodes. Some brevipes are in the pick too to show the broader leaf pattern. @Immortal1 here is the atlantis that has been trimmed twice. Wondering if many species get so labeled due to the light provided??? 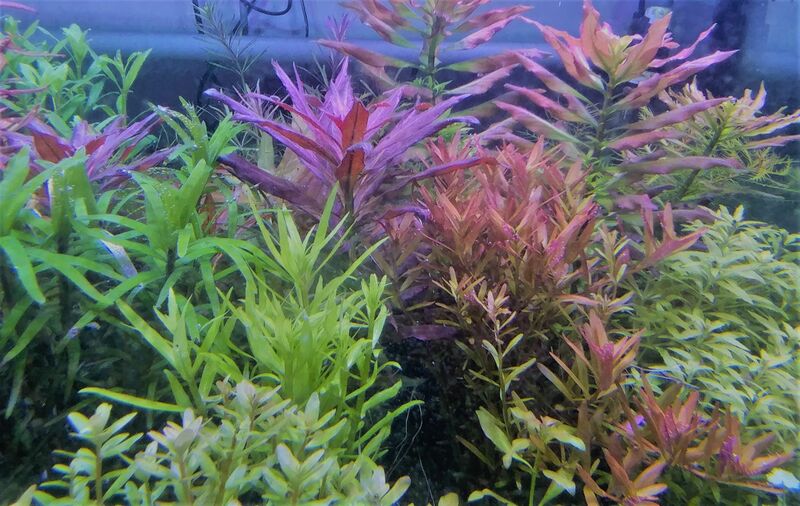 Many ludwigia can be "turned off" in a say 45PAR environment, I've done this many time returning plants to the 75G tank. Some pics from the top with pump shut off. Instead of a full tank shot I opted for two 1/2 tank shots. Even when trimmed the density is off the hook! It makes me happy though, all this extreme growing. Albeit not extremely difficult plants but I will graduate some day. Still playing the KH/Soft Water game @ a slow pace to KH reduction. Greggz, aqua-botanicae, rzn7z7 and 5 others like this. 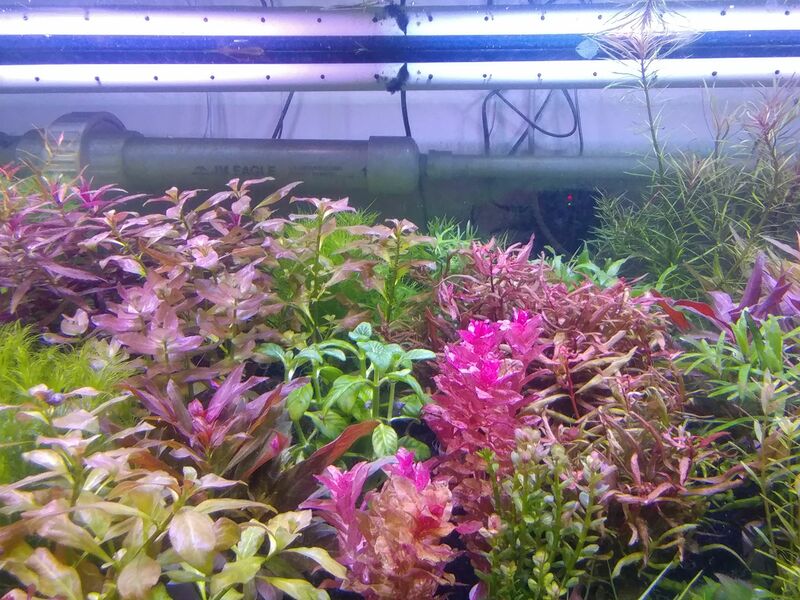 That Rotala macrandra is having a good time! Will you be @ GWAPA meeting next weekend?